The food you eat, the supplements you take, and the amount of exercise and quality of sleep you get all affect your ability to produce energy at the cellular level. But oxidation (free radical production), stress, overwork, and the quality of the air we breathe are some of the biggies that deplete our reserves and energy levels. Whether you just want an energy boost or you are an athlete wanting to achieve your goal … whether you suffer from chronic fatigue syndrome or congestive heart failure and heart disease, studies show that you can benefit from adding supplemental ribose to your health regimen. 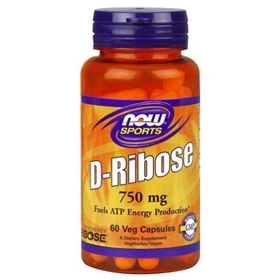 Everyone needs D-ribose because it is an essential ingredient in stimulating natural energy production. It is especially beneficial to older people, athletes, weekend warriors, and those dealing with chronic or unexplained fatigue, fibromyalgia, coronary artery disease, and congestive heart failure. Cardiologists are slowly recognizing specific nutrients play a vital role in preventing and treating heart disease, and particularly ischemic heart disease that underlies most heart attacks. When deprived of blood flow, the injured heart muscle becomes flabby and unable to pump blood efficiently. The sharp drop in ATP (adenosine triphosphate) levels experienced by heart muscle cells during the obstruction of blood flow, and the long delay in restoring those levels to normal even after blood flow returns is critically important after a heart attack. This so-called ischemia-reperfusion injury is now known to be the major culprit that produces long-term heart damage in survivors of heart attacks, rendering tissue inordinately vulnerable to free-radical damage produced by the oxygen-rich re-flow of blood into the injured area. Clearly, helping heart muscle cells to recover rapidly from a cardiac event is a major priority in preventing long-term damage. A natural ingredient for building new ATP, D-ribose is an important component of a “cardiac rejuvenation” regimen. Animal studies show that it dramatically increases ATP levels in the critical reperfusion period after a heart attack (the time when blood flow is restored and cells use energy at extremely high levels to repair the damage). This provides much-needed energy levels to block further injury and start the healing process. A landmark interventional study demonstrated these effects dramatically. The cardiac arrest induced during certain kinds of heart surgery (such as bypass surgery) causes heart muscle function to deteriorate quickly, even in relatively healthy areas of the heart, an effect that is associated with low ATP levels, which can severely delay recovery following surgery. As a result, the scientists administered D-ribose to the heart during surgery, reasoning that they could “stoke up” heart muscle in advance with the necessary ingredients for ATP. This procedure produced dramatic results in the experimental study consisting of a full hour of cardiac arrest. The ribose-supplemented experimental group showed significant improvement in heart muscle function compared with controls—and the amount of improvement correlated directly with the quantity of ATP in the heart muscle! Since then, convincing evidence has continued to accumulate that D-ribose directly contributes to the rejuvenation of injured heart muscle. D-ribose is a simple sugar molecule with a wealth of functions in human and animal biology. Perhaps its most important role is as a component of ATP, the universal energy carrier in the body’s cells. ATP molecules store energy as they are built up and release it as they are broken down—the more energy a cell requires, the more ATP it consumes. In fact, humans burn an amount of ATP equivalent to their own body weight every day. Every single process undergone by living cells requires energy—even at rest, we are continually breaking down ATP molecules. And that means that we have a constant need for the components of ATP molecules, including D-ribose. Cells can make new supplies of D-ribose, but the process is considerably slower than the breakdown of ATP2 and this can leave a substantial “deficit” in the amount of energy a cell can utilize. In fact, it has been shown that even an overnight rest period is not long enough for a person to recover their normal ATP levels after a bout of strenuous exercise. It’s no wonder that many of us feel drained after a hard workout—we are in fact drained of the very substances we need to make use of all of our available energy. When cells don’t have enough D-ribose to restore ATP levels quickly back to normal, they turn to alternate energy-generating processes. These are less efficient and produce much higher levels of damaging waste products that cause muscle burning and cramping and that can also inflict long-term damage through the oxidant stress they induce in muscle and heart tissues, leading to further dysfunction, injury, and pain. The latest research is demonstrating that ATP levels can be speedily brought back to normal if sufficient D-ribose is available. This has been demonstrated in the case of ATP depletion following strenuous exercise, which has implications for those who want to maintain health through lifestyle modifications. Perhaps more dramatically, D-ribose also restores ATP to normal or near-normal levels after the heart muscle injury seen in a heart attack. D-ribose is not a vitamin. Cells can manufacture it themselves, given enough time and raw materials. But when stressed by injury or high energy demands, they can’t keep up—leading one nutritional biologists to include D-ribose in a list of “conditionally essential” nutrients—those that have to come from outside the body under conditions, such as heart disease, which impose exceptional stresses on human tissue. Suggested Usage: As a dietary supplement, take 2 to 6 capsules daily, prior to exercise. Serious athletes may want to double the dosage during training. Consider taking this product in combination with NOW® Creatine, CoQ10 and L-Carnitine.